-7" Foam Face with 6" Velcro Backing. Buff and Shine's Uro-Tec pads will work great with virtually any polisher, but will be especially favored by those detailing technicians who prefer long-throw or long-stroke DA polishers (RUPES Polishers). 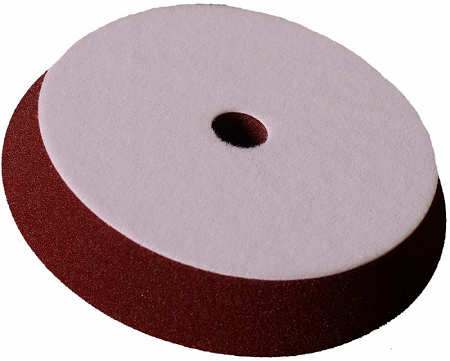 Uro-Tec pads are perfectly balanced for these specific types of polishers. This balance reduces vibration and pad "hopping", which leads to superior contact with the polishing surface, which increases polishing efficiency. The dimensions of the Uro-Tec pads are designed to maximize buffing and polishing efficiency. The backing diameter is 6" to fit perfectly onto long-stroke DA polishers. The 1" pad thickness provides a perfect balance between stiffness, providing consistent contact across the pad face with larger flat panels, and flexibility, allowing the technician to maneuver the pad into body contours. Because of their beveled design, the working area is actually 1" larger in diameter than the base and thus provides a larger working area than a squared-off design.